Another campsite review coming your way! 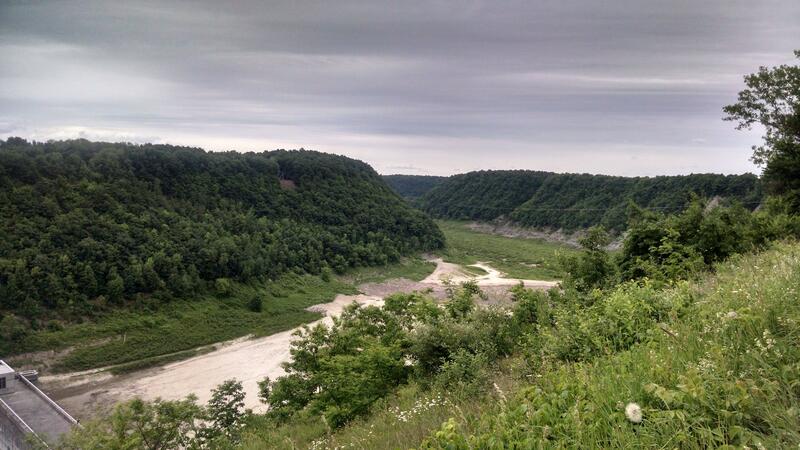 Late in June my girlfriend and I spent a week cabin camping at Letchworth State Park located in Castile, NY. The park is considered to be the “Grand Canyon of the East” and whether that title is self-claimed or by someone else, the gorge really is impressive and beautiful. Castile is located in Western New York, about an hour south of Rochester and an hour east of Buffalo, in the Genesee Region of New York. There are five separate cabin areas with about 10+ cabins in each area, and then a large campsite are with over 200 campsites. The park itself is 18 miles long running North to South, so there is considerable distance (and multiple entrances) between everything. We stayed in cabin area C which is located in the Northern end of the park, and has more ‘rustic’ cabins that have either wood/electric heat, a refrigerator, indoor lighting, 6 beds, a stove, and table and chairs. We stayed in cabin 1 which was a basic one room cabin compared to some of the others in the area as well as the least expensive. It rents for $72 a night or $288 for the week which comes out to $41 a night. There are comparable cabins in the South end of the park in cabin area D. You can read about all the amenities and different cabin styles in the cabin information brochure. The cabin itself wasn’t in great shape, with one of the windows missing the mesh screen to prevent bugs from coming in and the regular screen coming detached from the cabin. So this made one of the windows unusable and the bugs were constantly trying to sneak in. The bathrooms in cabin area C were not the greatest, but the cleaning crew was there every single day we stayed. I think the toilets just flushed very poorly and the bathrooms were just old in general. The showers had plenty of hot water and there was a changing area to stay dry in front of the showers. The only drawback was that there was only two showers in each bathroom. We’ve stayed in places with better cabins and facilities, but honestly neither of us are that picky and it did not get in the way of enjoying ourselves. 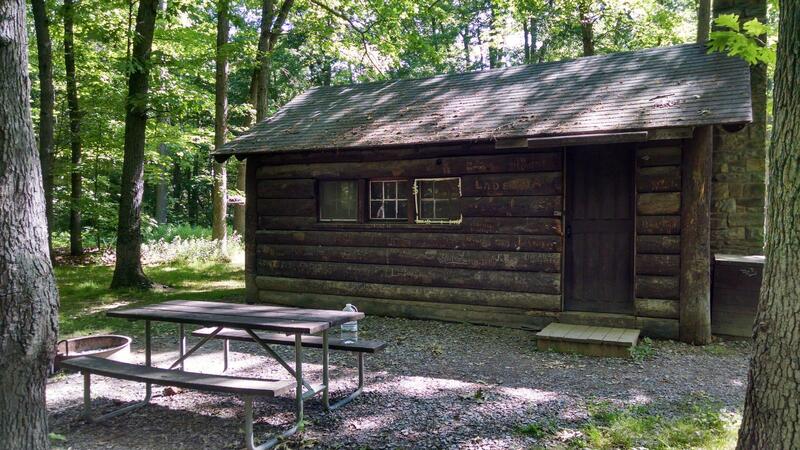 The front of Cabin 1 in Cabin Area ‘C’ within Letchworth State Park. The park itself is gorgeous, and the views of the gorge and waterfall were amazing. We went rafting through Adventure Calls Outfitters down the river and had a blast. Our guide was awesome and the other people on our raft were very nice making the whole experience enjoyable. You can purchase a waterproof camera (or store a cellphone/camera in a dry bag) and I recommend doing that as the views from down on the river in the gorge are awesome. There are also hot air balloon rides but the price was a little out of our budget range at $260 per person. People on the rafting trip highly recommended going for a balloon ride though. There are also plenty of trails, overlooks, and waterfalls to keep you entertained for a few days if you are trying to check them all out. We really enjoyed the gorge trail as well as the trail at the Gardeau Overlook. The park has an olympic sized swimming pool as you are not allowed to swim in the river. Just outside of the park we also went on a tour of the dam that you can see from inside Letchworth State Park, though the entrance is just outside of the park in the town of Mount Morris. We also took a day trip to Buffalo and saw a free concert on the Canalside during the night. The one thing that we were disappointed with in the park was some of the trail maintenance on the Eastern side of the park. We really enjoy hiking so with the amount of trails in the park we were excited about that. One of the trails (trail 16) showed that it intersected a main trail in the map in two spots, but in reality it seemed like one branch of the trail went away. There was a barely hanging sign that indicated we were heading in the right direction, but then it seemed like the trail just disappeared. Since it was getting later we ended up just turning around instead of trying to push to the overlook. Other trails on this side of the park and in the Northern sections also just seemed to be overgrown and infrequently traveled as well. Everything near the waterfalls and Southwest section of the park was beautifully maintained though, it would have just been nice to see this throughout the entire length! While this park may not be the best place to spend a whole week for most people, I think it’s worth at least worth a long weekend. You can see most of the “main” attractions down in the Southern end of the park in a day. Absolutely go take a rafting trip, and we were told that the balloon rides are amazing even though we did not take one ourselves. There are multiple price points and amenity styles in the different cabins, so pick one that suits your personal and budget needs. You can also simply just stay at a campsite as well!